I’m entirely agnostic about live action superhero properties staying true to their comic book character designs, but if you spend three episodes building up to the big reveal of your villain’s scarred face, it better have at least a little bit of oomph to it. Instead, The Punisher pulls the equivalent of putting an attractive actress in glasses to pretend that she’s mousy. Billy’s “mangled” face makes Gerard Butler’s lackluster Phantom of the Opera design look like a masterclass in horror makeup. 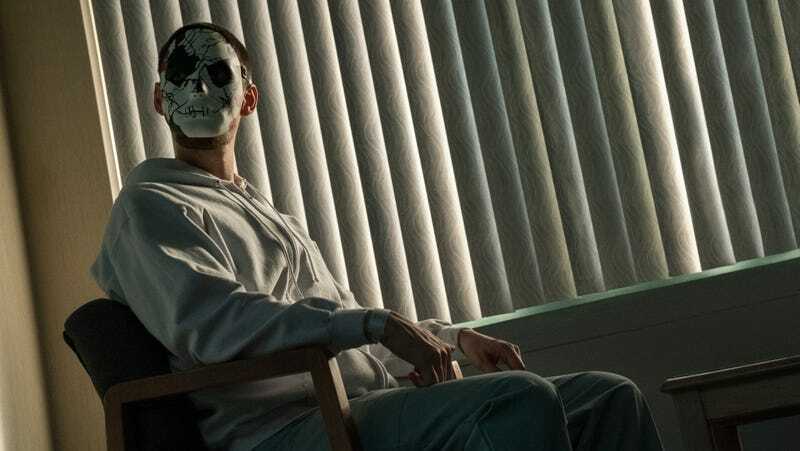 Billy’s artfully placed scars are barely enough to bat an eye at, and the idea that he was still wearing his mask around the hospital when his face was in this state of recovery is patently absurd. (Shout out to those plastic surgeons for their impeccable work, however!) And while I guess the show could be trying to make a point about how much of Billy’s self-worth was tied into his looks, to the point where this level of facial scarring is a major psychological burden for him—it feels more so like the show expects us to be genuinely shocked and horrified by his decidedly non-horrific face. 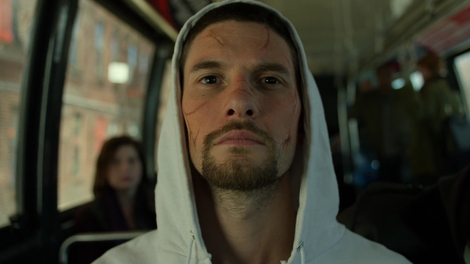 While the reveal itself is dumb, this episode at least allows Ben Barnes to remind us that he’s one of the most compelling actors on The Punisher. He does what he can behind the Jabbawockeez mask he still wears in flashback scenes to his sessions with Dr. Dumont, but, unsurprisingly, he’s a more compelling actor when he’s allowed to use his entire face to act. Billy isn’t the sole focus of this episode, but he’s by far its most interesting character. Frank meant to leave Billy a wounded man who had to live with his sins. Instead, he left him a wounded man with no memory of what he even did wrong. “Scar Tissue” is an episode about trauma. As I mentioned in my review of the premiere, Frank started this season the healthiest we’ve ever seen him. And though he was quickly sucked back into the mire of violence that seems to follow him everywhere, he’s clearly still in a much more stable place than he was at any other point we’ve seen him. Leaving Billy injured but alive really did seem to be the thing he needed to do to let himself heal. Yet as other characters in this episode point out, Frank didn’t spend much time thinking through the consequences his actions might have on other people. Madani and Curtis (great to have him back!) have both been haunted by the specter of Billy ever since, which has stopped them from fully moving forward in their own lives (Madani much more so than Curtis). And, of course, Frank has created a throbbing nerve of trauma in Billy himself—a man who’s now gone on to inflict a whole lot of violence on other people, some of whom are villains (his childhood abuser Arthur) and some of whom just have the misfortune to get in his way (those hospital security guards). Frank’s closure came at the expense of a lack of closure for everyone else. The other character processing some (non-Frank related) trauma is Rachel, sorry, Amy. She’s a person who processes her trauma by running from it, and when she’s unable to do that, she finally has to face it head-on. (I’d argue there was space to explore this storyline in the thin second episode, but whatever.) She opens up to Frank about what it was like to be the sole survivor of the slaughter of her teen criminal gang, and discovers that the two of them have more in common than she thought when she learns about his dead family. Unfortunately, the Amy/Frank dynamic has yet to fully click into place for me. On paper “Frank bonds with a teenage girl” seems like an ideal concept around which to build a season. Unfortunately, neither the writing nor Giorgia Whigham’s performance have done much to make the character a compelling addition. Hopefully she’ll become more interesting as she becomes less of a cipher. “Scar Tissue” is a largely action-free episode that slows things down to check in on its characters. That would be much more effective if the first three episodes of the season didn’t already feel like they had a whole bunch of moments that ostensibly did the same. On paper, there’s a lot of strong thematic stuff to enjoy in this episode. In practice, however, it feels more like Billy’s facial scarring: I can see what they were going for, but the oomph just isn’t quite there. Would Billy really have spent his 1980s childhood idolizing Joe DiMaggio? I mean, I know the guy’s a legend, but it feels like a pretty retro reference point. I will never get tired of the way Frank says Madani’s name in a frustrated huff. Why does Madani have a bedroom door that locks from the outside? A lot of Amy’s dialogue feels really clunky (and her referring to a funeral as a “fancy event thing” was super weird), but rejecting Frank’s offer of a relaxing cup of coffee because of the caffeine was a nice moment of character specificity. I forgot about that freeze frame footage of Frank sliding over the police car hood, and I loved it just as much as I did last season. Madani shooting Mahoney was certainly something.